Depending on the registration numbers we may combine the 9 and 10 year old levels into a single league. This is baseball played on a 46/60 field, which means the pitching distance is from 46' and the bases are 60' apart. The entire line up bats, however there are only 9 defensive players on the field at a time. This means the coach must distribute playing time while continuing to develop the skills of players. 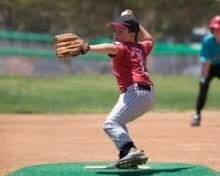 Skills that are focused on at this level include basic hitting, throwing, fielding, pitching and catching. Players are expected to bring a glove and while not required, baseball pants and cleats are a plus. During the season additional tryouts are held to create 9u and 10u District teams. These teams represent Egg Harbor Township in the Cal Ripken tournament trail which at some age levels could lead to a World Series. In addition these teams play in other local tournaments.